While the glorification of saints in the Orthodox Church has been taking place for nearly 2000 years, few people today are certain about how this really happens. Does the Church "make" a saint? Are there special panels which decide who can be considered for sainthood? Are saints "elected" by a majority vote? Does a person have to perform a certain number of miracles in order to qualify as a saint? The answers to these questions may be surprising to some. We know that there are several categories of saints: prophets, evangelists, martyrs, ascetics, holy bishops and priests, and those who live a righteous life "in the world." What they all have in common is holiness of life. Three times in the Book of Leviticus (Ch 11, 19 and 20) God tells us to be holy, because He is Holy. We must consecrate ourselves, for we are His people. In the Divine Liturgy of St. John Chrysostom we hear every time the words: "The Holy Things for the holy people of God." Saint Peter reiterates this commandments in the New Testament, challenging us to obey God's Commandments and submit our will to His Will (1 Peter 1:16). Everyone is challenged to manifest holiness in their lives, for we all must become saints! This is our special-and common-calling from God. It is not something reserved for the clergy, monastics, or those who are "more pious". Everyone who has been baptized into Christ must live in such a way that Christ lives within us. "Do you not know," Saint Paul asks, "that you are God's temple and that God's Spirit dwells in you?" (1 Cor. 3:16). So, the glorification of Saints in the Orthodox Church is a recognition that God's holiness is manifested in the Church through these grace-filled men and women whose lives were pleasing to God. While glorification of a saint may be initiated because of miracles, it is not an absolute necessity for canonization. The Roman Catholic Church required three verified miracles in order to recognize someone as a saint; the Orthodox Church does not require this. There are some saints, including Saint Nicodemos of the Holy Mountain (+July 14th) and Saint Innocent of Moscow (commemorated March 31st), who have not performed any miracles, as far as we know. What is required is a virtuous life of obvious holiness. And a saint's writings and preaching must be "fully Orthodox," in agreement with the pure faith that we have received from Christ and the Holy Apostles and taught by the Holy Fathers of the Church and the Seven Ecumenical Councils. Can the Church "make" a saint? The answer is no. Only God can do that. We glorify those whom God Himself has glorified, seeing in their lives true love for God and their neighbors. The Church merely recognizes that such a person has cooperated with God's grace to the extent that his or her holiness is beyond doubt. Are saints "elected" by special panels or by majority vote? Again, the answer is no. Long before an official inquiry into a person's life is made, that person is venerated by the people where he or she lived and died. His or her memory is kept alive by the people who pray for his or her soul or who ask him or her for intercession. Sometimes, usually through the diocesan bishop, for the Church to recognize that person as saint. The formal Rite of Glorification begins with a final Memorial Service for the person about to be canonized, after which Vespers and Matins with special hymns to the saint are chanted and the saint's icon is unveiled. The saint's life published and the date of his or her commemoration is established. The Orthodox Churches are notified of the glorification so that they can place the new saint's name on their calendars. First of all, miracles connected with the life of a Christian and miracles occurring after his/her death in connection with his/her commemoration. Secondly, the veneration of a Christian by the Orthodox Christian faithful. And finally, his/her righteous life. Furthermore what is taken into account is the incorrupt bodies or holy relics and the fact that they exhume a sweet aromatic odor when they are exhumed from their crypt or grave. Professor and Orthodox theologian, John Anthony McGuckin writes the following: "They are usually not officially declared to be saints until their veneration has become a widespread matter in the churches: that is, a lot of Christians agree over a long space of time that here in this particular life was a true example of God's glory. For this reason the official service declaring them to be saints of God is known as their "Glorification." In antiquity their glorification often was a matter of immediate acclamation. Certainly this was the case after martyrdom, for it is the ancient belief of the Church that a Holy Martyr, in his or her suffering, receives immediate spiritual admittance into Paradise...Until the end the Church on earth prays for the righteous dead, and for the repose of their souls. On the other hand, those it has recognized as great saints, already active in Paradise, it does not pray for in the same sense: it asks assistance from them. 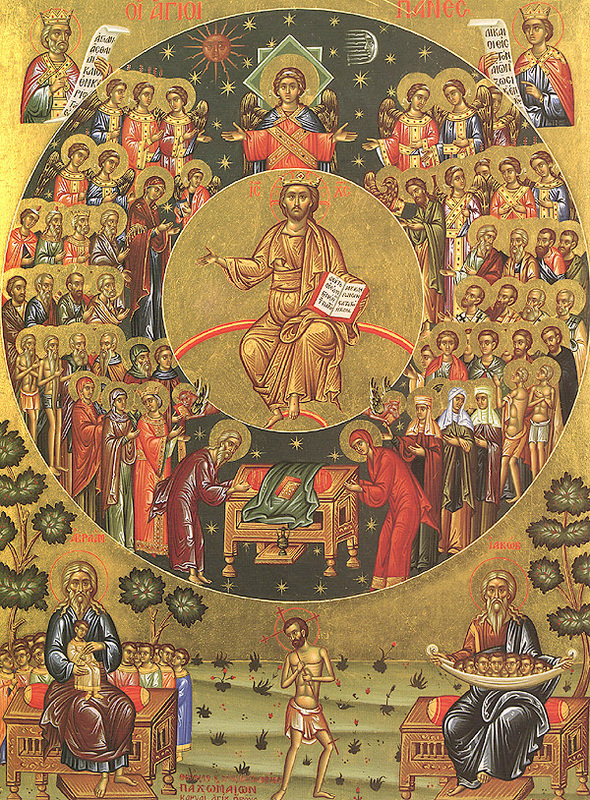 The great saints, although equally not yet fully 'coherent' in their final glorified body, still have a more active ministry in the glorified life, and are closer to the enjoyment of the full freedom of Paradise, because the energy of the Spirit of God that was in them has brought them closer to the condition of the finally glorified body already. "Star differs from star in glory", as the Apostle said. There are several services of intercession (paraklesis) used in the Church specifically dedicated to asking the intercessions of the Blessed Virgin and the Saints. The Orthodox regard it as natural that the great saints should continue to exercise loving benevolence in this way. It also gives theological testimony to several important aspects of the Orthodox understanding of the Church as the communion of Saints. First of all it shows in a very practical way that Christ arranges our salvation not in a narrowly individual manner, but in a way that is deeply interconnected with the family of souls around us with whom we lie and interact. None of us gets to Paradise alone. Our pilgrimage there is a long trail of dependencies, and philanthropies. Saint Symeon the New Theologian called it a "golden chain" in which we were always initiated into the love of Christ through other members of the communion. We know that this merciful interaction (the growth of holiness in society), both its negative side (all the damage we do to other people by our lack of faith and our sinfulness) and its therapeutic side (the way we manage to atone, and find forgiveness and reconciliation) are all an integral part of the Great Communion (koinonia) which constitutes the spiritual interconnectedness of all Christ's elect: The Angels in heaven, the faithful on earth, and the chosen ones in Paradise. Many parts of Western Christianity have lost the sense of the close involvement of the saints in the ongoing daily lives of Christians. Some even think that devotion to the closeness of the saints in this way is a distraction from a direct engagement with the presence of the Lord in a Christian consciousness. It is a great mistake to think that the soul finds Christ nakedly and alone. The Lord always comes to us in the family, and through the medium of the love of other members of the communion. He came to His world through the Holy Virgin. He comes to us in faith, even to this day, through the ministry of those who have loved us and nurtured us, and formed our minds and characters in a thousand ways. He comes to us in the Holy Scriptures, directly, yes, but also through the countless hundreds of thousands who have transcribed, collected the texts, and preached them to society over centuries. There is no direct and solipsistically solitary path to the Christ. If we find Christ we find the heart of love and communion. Those who wish to find the Lord alone, and possess Him alone, have not found the true Lord… The Orthodox veneration of the saints is widely understood by all levels of the faithful, educated or not. And the celebration of the saints is deeply integrated with the sense of the Church as a communion of word and sacrament. This has been a pattern of Eastern Christian life since the earliest centuries, when the tombs of the holy martyrs grew into being the local parish churches...The saints and Angels are already living, or learning to live, in that luminous element. We on earth are in a more primitive state of paideia, and both our justice and our mercy is erratic. It is, therefore, very useful to study the lives and deeds of the saints in order to see how flesh-and-blood people like ourselves responded in their own particular historical conditions to the demands of the Gospel imperative. ...Be that as it may, Orthodoxy understands the saints to be more than simple examples from history. They live on near us, even when parted from us in their degree of glory. Like the Lord they served, they are merciful and gracious, and not only do they offer us a model to look to, they can, and often do, answer prayer, and delight in bringing to us the grace the Lord Himself has given them for our benefit.